There are few institutions in the country better equipped to help students learn the space business than Santa Clara University, which has seen its satellites go into space since 2000. The Robotics Systems Laboratory, part of the university's School of Engineering, has designed and constructed numerous satellites that have been launched into space on NASA and private rockets. The satellites are small — some as compact as an iPhone — and intended to gather data for discrete experiments. The management of these "nanosatellites" is a continual challenge, since they only go directly overhead a few times a day and for just minutes. 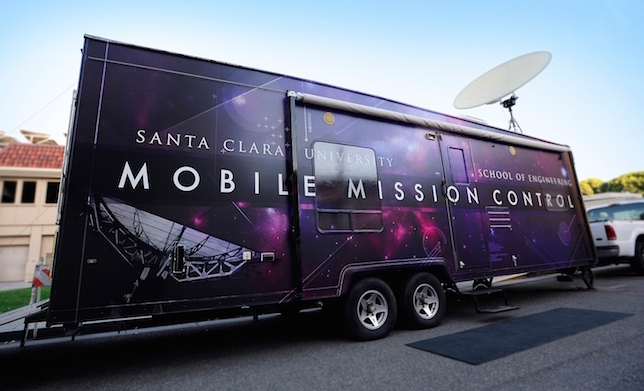 Now, with a new "Mobile Mission Control Lab," a 28-foot trailer packed with equipment that can be used on the run, students will be able to communicate with the satellites for longer periods, in order to send commands and capture data streams. "This mobile station makes us more efficient and agile," said Engineering Professor Chris Kitts. "We now have the potential to more than double our communication time. It's a huge learning opportunity for our students." 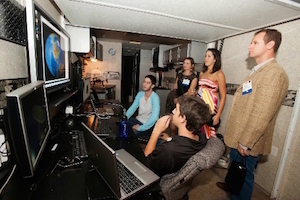 In order to learn satellite operations, students are currently using the mobile lab to manage a NASA satellite in orbit that has already finished its primary science mission. The program expects to add an additional eight satellites from NASA to its control list; all are scheduled for launch in 2015. By then, the school reported, the mobile lab should be able to operate at least one of those. "Opportunities like this are what I love about my education at Santa Clara," said student Nick Xydes in a statement. "This isn't just a student project. I'm actually controlling these satellites for NASA and private companies on a professional level. It's one cool way kids who grew up dreaming about space exploration can have a taste of the adventure." The mobile lab will also take to the road to show students in K-12 what's involved in controlling satellites and running space missions. "This is one great example of our 'Engineering with a Mission' goal," noted Engineering Dean Godfrey Mungal. "These students not only will get hands-on experience and help run experiments that could better society, but also they'll communicate that experience and inspire the next generation of great engineers."